In partnership with the International Transport Workers Federation, a global federation of 690 unions representing over 4.5 million transport workers in 153 countries . 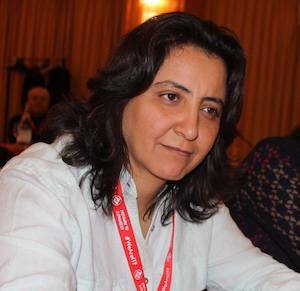 Nermin Al-Sharif, leader of the Dockers’ and Seafarers’ Union of Libya, works relentlessly for the protection and advancement of human, workers' and women's rights in Libya, in the Arab region, and globally. As a result, she has been subject to ongoing attacks on her freedom and personal safety including several attempts on her life. In the latest incident Nermin was detained for a number of days and has had her passport confiscated subject to 'an investigation'. Please join us in calling on Mr. Ghassan Salmah, the UN representative to Libya, to help end the campaign of intimidation and violence against Nermin. On 7 December 2017 we confirmed that Nermin's passport was returned to her, and she has received an official apologies. She thanks the ITF, LabourStart and everyone who supported this campaign.